The contract signing ceremony was presided over by Chiang Mai Deputy Governor Borworn Rattanaprasit (seated 3rd left), president of 10 Northern Provincial Chambers of Commerce Rachan Veeraphan (2nd left), Jumpol Chutima, president of Chiang Mai Chamber of Commerce (standing center, in dark suit), and other guests of honor. The Committee of Economic Quadrangle Cooperation Zone and 10 Northern Provincial Chambers of Commerce arranged a press conference for the contract signing ceremony to use the 700th anniversary sport complex to hold the Quadrangle Expo 2003 on December 4-15, among the neighboring nations. This festival will be packed with 1,000 booths from Thailand, China, Laos, Burma, Cambodia, Vietnam and Bangladesh. Tourism Authority of Thailand (TAT), Northern Office, Region 2 with the cooperation of the Hill Tribes Aid and Development Center are planning to set up a series of mini light and sound shows called “Akha Khon Phu Khao” at the Hill Tribes Aid and Development Center, Mae Chan district, Chiang Rai province. Tanya Nikrothanon, the director of TAT, Northern Office, Region 2 said that the Akha Khon Phu Khao light and sound show has been shown every year since 1999. This year, in the high tourist season, there will be six rounds of the show: on November 22, December 31, January 24, 2004, February 7, 2004, March 27, 2004 and April 1, 2004. The admission price of 290 baht includes dinner. The show presents the way of life of the Akha, one of the hill tribes that live in the north of Thailand. The actors are the hill tribe people who live at the Hill Tribes Aid and Development Center. The shows help to earn more funds to support the activities of the center and to conserve the way of life of the hill tribe people. You can book tickets at Chiang Rai Tourist Business Association Tel. 053 601 299, 053 715 690, the Hill Tribes Aid and Development Center Tel. 053 609 249 and TAT Chiang Rai Tel. 053 744 674-5. Mplus+ looking for smart men with smart brains. Women’s lobby says impossible! Program for Appropriate Technology Health (PATH) in cooperation with Family Health International Institution sponsored by USAID, launched Mplus+ to push men to be more aware of AIDS/HIV infection and sexually transmitted diseases (STD’s). Models on stage pose for the Smart Man Smart Brain Contest motivating modern men to be more concerned about their health. Mplus+ aims to motivate men to be more concerned about their health, push them to be more responsible about their sexual activity and encourage them to consult with a doctor when they have a problem. “Men do not go to a doctor and talk about their problems. We began this project to extend our services to cover people who are too far away to get the services and afraid of going to see a doctor,” said Chonlisa Chariyalertsak, health technical chief officer at the Chiang Mai Public Health Office. As a part of this project, Mplus+ will arrange a Smart Man Smart Brain Contest, inviting male contestants aged between 15 and 25 to be at Buddhasatan Temple on November 8 during the Chiang Mai Loy Krathong festival. This contest is looking for a man having good health plus a smart brain to be a role model for other men to promote physical and mental well-being. It will be held in three languages; Northern Thai, Central Thai and English for all people attending the Loy Krathong Festival. This project is under the supervision of Chiang Mai Public Health Office supported by many private sectors, such as Rainbow Sky-Lanna or Purple House. Four Seasons’ award-winning resort in Northern Thailand, The Regent Chiang Mai Resort & Spa, has opened a new 58-seat restaurant called Terraces. (From right) Santad Saksoong, executive editor of Chiang Mai News, Sangwan Sapma, PR officer and Somock Inthavong, resort manager of the Regent, Marion Vogt, marketing & communications manager of Chiangmai Mail, enjoyed the chance to try out the new Terraces Restaurant. Situated in the center of the resort beside the main swimming pool, Terraces features an expansive view of the surrounding rice paddies and the distant Doi Suthep Mountain Range. An expandable canvas ceiling cover can be opened during the day to keep guests cooler during the sunny daylight hours. In the evening the canvas can be hidden away to ensure guests enjoy the shimmering stars and magical ambiance of the resort’s peaceful location. Zero percent interest rates. You can’t get much lower! The Chiang Mai-based Chichang Co. launched its new notebook range to the young generations of students and businessmen at its Central Airport Plaza Shopping Center Branch. This marketing campaign was launched in the North in October by Sumalee Luekuan, Chichang’s marketing manager, for the latest model notebooks priced at 49,900 and 79,900 baht. These models are aimed at the targeted groups of students and small and medium scaled enterprise entrepreneurs. Sumalee added that clients are satisfied with the new products that have been purpose designed for their use. Sumalee said that this offer includes time-payments, starting with interest rates as low as zero percent. For more information, contact product manager Kanokporn Sukrongchang, telephone 053 903 624-5. From left: Bundhikar (Ann), Niramol (Tai) and Kanokporn Sukrongchang, product manager during the promotional campaign for the company’s IT products. Niramol (Tai) Adulprasartporn (left), and Bundhikar (Ann) La-orchairangsri, Chichang’s Customer Service Officers launch the new products. The newly introduced notebook models on display. Hanna and Dr. Christian Velder bade farewell to Chiang Mai friends at a party hosted at their lovely riverside home on the evening of October 23, 2003. The Velders are moving home to Germany. In a lovely message to their many friends, Christian talked about pondering the word “time” and how much their time in Chiang Mai had meant to them. In a toast to the Velders, friends agreed that they would not say “good-bye” but only “farewell” as all are sure to meet again along the way. 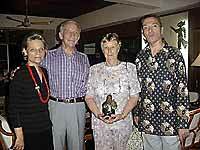 From left: Hanna, Frank Weicks, Rebecca Lomax and Dr. Christian Velder pose for a final farewell photo. Although Hanna’s fabulous way with German food was missed, Chef Adrian of the Amari Rincome prepared a delicious feast of German specialties for the catered dinner. Friends gathered on the terrace near the river to eat and talk. Mementos of the Velders’ time in Thailand were displayed in an upstairs room, and Hanna asked guests to choose one as a souvenir. No reason to look so sad since friends are like stars. Sometimes you don’t see them but you know they are always there. From left: Hanna, Peter & Anne Dawson and Dr. Christian. Because the Velders have been active supporters of Seven Fountains Church and the Children’s Milk Fund, guests contributed whatever they wanted to for the Milk Fund. The evening ended with farewell wishes and anticipation of future meetings. October 26 was the Austrian national holiday. The Austrian National Day commemorates the day in 1955 when the Soviet Union ended its occupation, and a constitutional law of perpetual Austrian neutrality was enacted. (From L) Swiss national and long time resident of Chiang Mai, Lorenz Ferrari tries Chef Adrian’s ‘tafelspitz’, as Gerhard Wammerl, the corporate bakery and pastry chef of the Amari Group looks on. The Amari Rincome celebrated this with a special Austrian National Day lunch buffet. 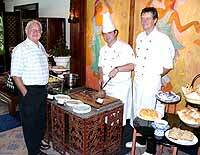 Chef Adrian cooked it all with specialties from the different regions of Austria. It featured the most popular dishes, such as wiener schnitzel (a veal or pork cutlet fried in breadcrumbs), but also Hungarian goulash and paprika chicken, which, although originally coming from Hungary as the name suggests, has since taken the Austrian kitchen by storm. One of my personal favorites was on offer - ‘tafelspitz’, a quintessentially Viennese dish of boiled beef, potatoes and horseradish sauce. We also very much enjoyed kn๖del (dumplings) and erdไpfelsalat (potato salad) and the fresh cooked ‘tiroler g’r๖stl’ (grated onion, meat and potato fried in a pan). Austria is also a country with a famous sweet tooth, with the most delicious rich desserts (mehlspeisen). Apart from the usual apfelstrudel, and the ‘normal, every day desserts’ this special Austrian Sunday brunch even had every kid’s dream come true - the politically incorrect “moor in a shirt” - a chocolate pudding with hot chocolate sauce and whipped cream. By the time this lunch was over we were stuffed as a turkey at Thanksgiving but we left looking forward to the next national day. The Tourism Authority of Thailand (TAT) is busy these days. There were two big events that pulled the world attention towards Thailand within one week. First, the World Youth and Student Travel Conference was organized this year in Pattaya on October 12-18. WYSTC is the world’s only trade fair devoted exclusively to the youth and travel industry. It was a joint event of the Federation of International Youth Travel Organizations (FIYTO) and the International Student Travel Confederation (ISTC). The World Youth and Student Travel Conference was organized this year in Pattaya on October 12-18. WYSTC is the world’s only trade fair devoted exclusively to the youth and travel industry. It was a joint event of the Federation of International Youth Travel Organizations (FIYTO) and the International Student Travel Confederation (ISTC). The venue of the conference was well chosen at the fabulous Royal Cliff Beach Resort that boasts one of the most comprehensive meeting and banquet facilities in Thailand. Despite the currently reluctant tourism industry climate, there were 600 delegates representing 320 organizations to gather daily at the brand new Pattaya Exhibition and Convention Hall (PEACH). Because of the Iraq War and SARS, youth and student tourism are down 20% this year. Working for a better world is in the interest of all travel entrepreneurs, but there are increasing tensions between different cultures and growing environmental issues to deal with. In addition, population trends and globalization are widening. So, the main message of the conference was peace through tourism. TAT invited some selected journalists to join the press conference on October 15 in the afternoon. Suppakit Balachandra, director domestic market development, mentioned that youth tourism had a 46% market share of Thailand’s visitors in 2002. That is why TAT will promote eco-tourism, agro-tourism and soft adventure tours to attract more price conscious people and students in the age range from 15-30. David Jones, director general of ISTC, noted that young travelers usually stay longer, actually 63 days per trip, spending 2000USD on an average. Some important sponsors of the event were the Australian Tourist Commission, Messe Berlin, Tourism Bureau Taiwan, and Visit Britain. 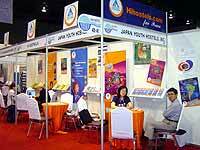 Booths from Thailand were occupied by Educational Travel Center, Greenway, Hostelling International Asia- Pacific, STA Travel Thailand, Thai Airways International and TAT. Also present were Thai Eco-Tourism and Adventure Travel Association (TEATA) and Thai International Education Consultants Association (TIECA). Stephen Young, director-business development, organized the PATA booth, handing out the newly printed brochures of the Ninth Mekong Tourism Forum, that will be hosted at Sheraton Chiang Mai on March 26-28, 2004. The second event happened in Bangkok with the APEC Investment Mart 2003 at Impact Exhibition and Convention Center, Muang Thong Thani, on October 16-21. The office of the Board of Investment (BOI) incorporating with several key players in the service industry demonstrated full potential and bringing back Thailand on the road to sustainable growth. The impressive Thai Pavilion was promoted as “Gateway of Southeast Asia” and “Land of Investment.” New tourism products are cruises on the Chao Phraya River, Underwater World Pattaya, Seatran Ferry to go to Ko Samui, Phuket Submarine, and Sunsail Thailand. Also, there was a vivid demonstration at the booth of Thai International to highlight the new business class seats of B777-200 using upholstery that reflects the ambitious character of the airline. At the same venue, Bangkok Airways presented all up to date travel routes, and introduced the new route of Bangkok-Krabi including sale promotions and special price airfares. Very interesting and displaying exciting projects were the investment exhibitions of the other APEC member economies, especially the presentations from Malaysia, China, Taiwan, Singapore, Korea, Brunei, Vietnam, Philippines, Papua New Guinea, and Indonesia. Thai handicraft products were shown at the booth of One Tambon One Product (OTOP) exhibition, referring to the controversial project of 17000 villages to receive 1 million baht each for local business. Last not least, I have to say thank you to Hans Spoerri, group general manager of Siam City Hotels & Resorts, to generously supply complimentary room accommodation at Siam Bayshore Resort in Pattaya and at Siam City Hotel in Bangkok for me during the two events accordingly. Both hotels have a real high standard of international service qualities and are highly recommended for tourists and businessmen alike.